Os grid reference: NJ 7599 2240. At the north-side of Inverurie town and at the corner of Brankie Road and Garden Terrace stands the Brandsbutt Stone, a Pictish symbol stone that has been lovingly restored. This large rock has a number of ancient symbols and an Ogham inscription on it. Strangely enough it now stands next to a modern housing development, but two large pieces of it were retrieved from a ditch near Brandsbutt farm, while another piece was found in a wall close by. The stone is sign-posted from the A96. Chapel of Garioch, where stands the famous Maiden Stone another Pictish stone, is 4 miles to the north-west on the A96, while the city of Aberdeen is 13 miles south-east in the opposite direction, also on the A96 road. There are several more Pictish stones in Aberdeenshire. The Brandsbutt stone is a class 1 Pictish symbol stone that is 3 foot 6 inches high and over 4 foot wide. It has some interesting carvings on it: a crescent, V-rod, Z-rod and a twisting serpent. There is also an Ogham inscription, a series of notches, recalling IRATADDOARENS which could be simplified as ‘Iratad Doarens….’ with a few notches possibly missing at the end which could be IUS or SIUS? Ogham was the ancient Irish alphabet script widely used in the Celtic west during the 5th-6th centuries, but also used in Scotland at a slightly later date due to the close ties between the two countries. The rock is made of whinestone, much quarried in Scotland, especially in the south. Thanks to a local man the Brandsbutt Stone has been lovingly restored to what it originally looked like. Two lumps of the stone were rescued in 1899 from a field-dyke dividing two fields and another piece from a wall, a little to the east of Brandsbutt farm, which has now been demolished to make way for the new housing estate (Elizabeth Sutherland ‘The Pictish Guide’). 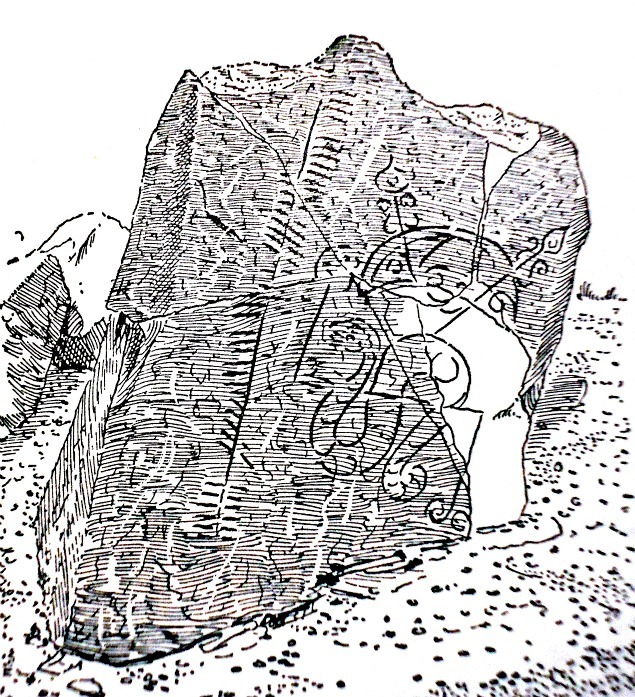 Thankfully, the stone was recognised as being of great historic importance and part of the Pictish kingdom of Scotland which “flourished” during the 8th-9th centuries, but which actually began ‘its life’ as early as the 4th century AD, according to Anthony Jackson in his delightful little book ‘The Pictish Trail’ 1989. Sutherland, Elizabeth., The Pictish Guide, Birlinn Limited, Edinburgh, Scotland, 1997. Categories: Pictish Symbol Stone | Tags: Brandsbutt Pictish Stone in Aberdeenshire, Brandsbutt Stone at Inverurie in Scotland | Permalink.